Chris Pronger is once again at the centre of media attention. This time it is for his interesting antics at the end of games one and two. 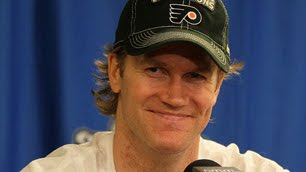 After games one and two, both Flyers losses to the Blackhawks, Pronger felt the need to steal the game pucks. This led to an incident after game two when the Blackhawks Ben Eager confronted Pronger. "He's been picking up pucks after the game, and I just told him he can keep it," Eager explained. Eager went on to say that it is no big deal and that the Blackhawks could care less if Pronger takes the pucks after the Flyers lose. Call it gamesmanship, or deflecting media attention away from his team, but the fact is Chris Pronger is being Chris Pronger. His actions did not resemble those of a playoff warrior, or even a grown man, they resembled behavior one would expect to find on an elementary school playground. It was nothing more than Pronger being a sore loser. The fact that this is even news is baffling in itself. "I couldn't hear him, I don't speak gibberish," said Pronger, who picked up a misconduct penalty at the very end and got into it with Eager. You shot a towel at Eager when he complained? "Why not? What's wrong? It's sitting there. What else is gonna happen to it? It's sitting there. Sure, why not. You got a problem with that?" Are you gonna sell it on eBay? "I don't know. Apparently, it got him upset. So I guess it worked, didn't it? It's too bad. I guess little things amuse little minds."